It's officially summertime in Texas! In the high 80s today, I am nearly sweating in a sundress and flip flops! As a true summer girl, I wouldn't have it any other way. I love warm weather! Here's my ideal weekend outfit: A bold Rebecca Taylor dress, classic aviators, baubles by Loren Hope, wedges, and a cork clutch to wear to a friend's birthday celebration. A bandeau swimsuit from Old Navy, a floppy beach hat and beach bag, and a Missoni towel for laying out by the pool on Saturday. Happy Friday! Friday is finally here, my dears, and what else is there to do but look at pretty things? 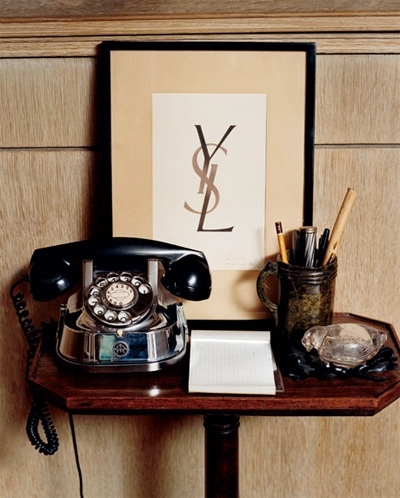 I am always drawn to well-styled vignettes. I feel there is definitely a perfect balance to creating one: Lots of layers, mixtures of textures, but never too crowded. 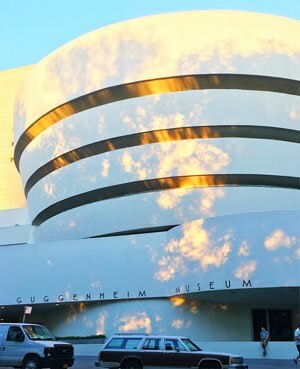 Today I wanted to share my 10 favorite vignettes with you. 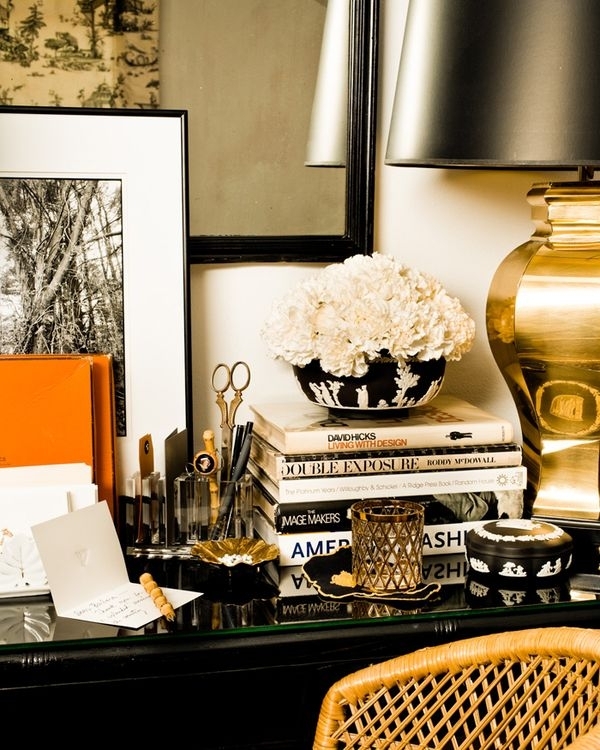 I have a natural inclination for stacks of coffee table books and gold details... but some of these vignettes truly are unique. Happy Friday, dears! Do you have any fun plans this weekend?! I love this bedroom! 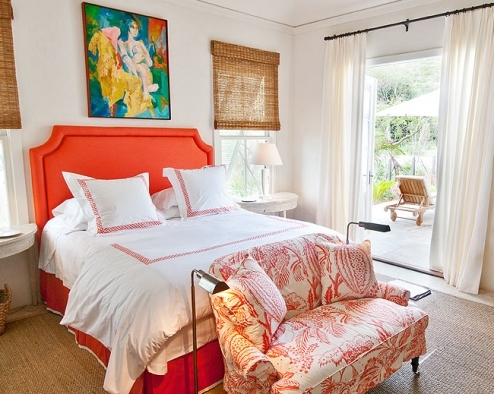 The bamboo blinds and jute rug add a natural element that works well when juxtaposed against the bold orange headboard and bedding. 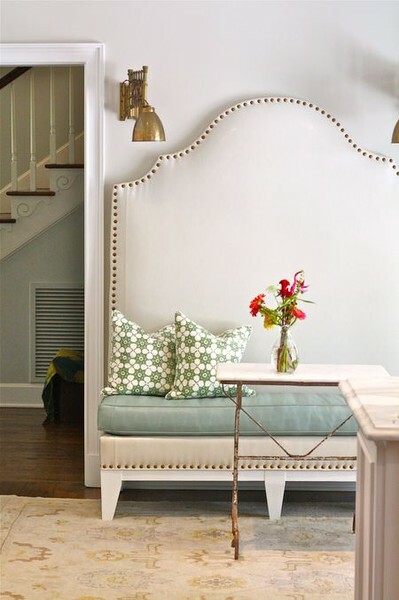 I also love the small brass floor lamps on each side of the upholstered settee. I would love to have a porch right outside my bedroom! We all loved this living room when it was first published in Domino. The pops of color, French couch, and quirky print created a fun, girly aesthetic. But how do we create the look for less? 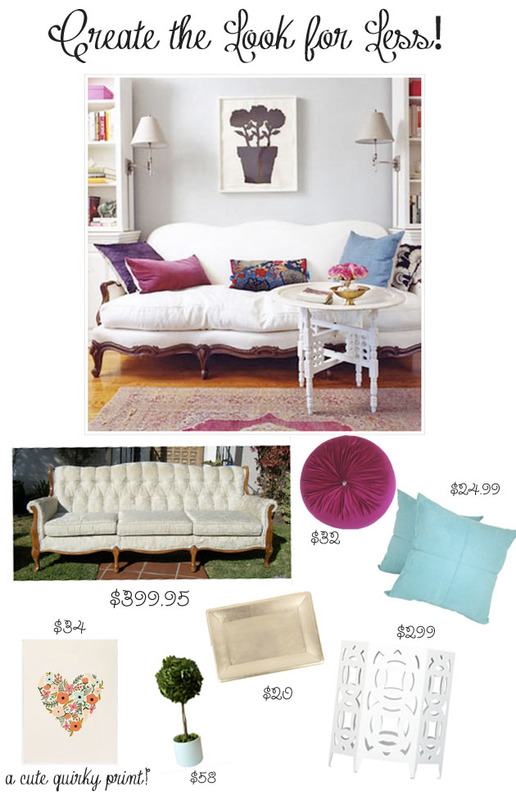 I've curated furnishings and accessories to recreate this room for the fashionista on a budget. I wanted to share a few of my latest Instagram snaps with you all to show you what I've been up to lately. 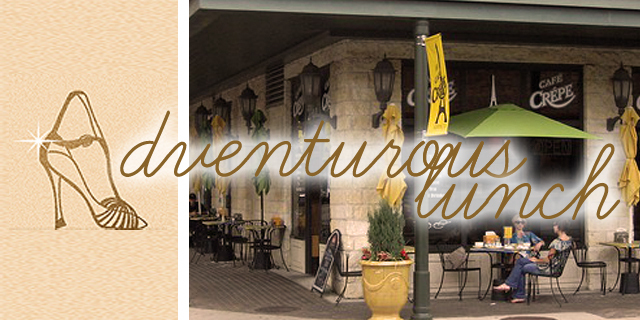 A visit to the Houston zoo and a road trip to San Antonio provided lots of pretty landscapes and sightseeing adventures. We visited the Alamo, and took a self-portrait while on the River walk. My boyfriend's funny face makes me laugh. 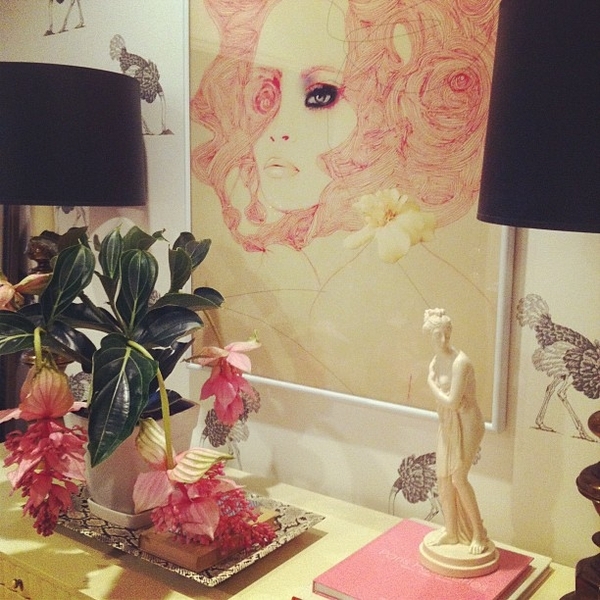 I also recently purchased a Leigh Viner print and a new frame from One Kings Lane. What have you been up to lately? I'd love for you to follow along with me! My Instagram name is @peakoftreschic. The big Coachella music festival is quickly arriving.... and I can't wait to see Santigold, Feist, Radiohead, Swedish House Mafia, Miike Snow, and all the other amazing bands perform. This will be my first time in Indio, CA for this music festival and I can't wait to enter "full-fledge boho mode." Still, I am clueless regarding my wardrobe. It's been a few years since I went to a music festival so I'll definitely need to make a few trips to Free People before being fully packed. For fashion inspiration, I went to Harper's Bazaar Coachella 2011 archives for ideas. I also think jean shorts and a big floppy hat are a must... how sick are these booties?! I love this ladylike look complete with an umbrella for sun protection. What's your favorite look? Any ideas for my weekend wardrobe?? I'd love your help! 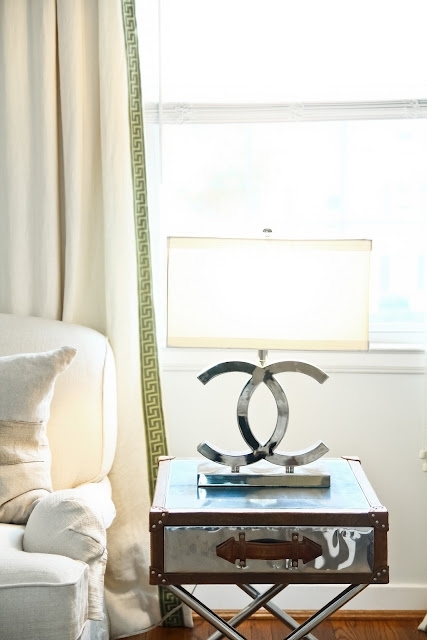 Crisp whites+turquoise lamp+pink and trellis patterned curtains= one stylish boudoir. Hello hello pretties! i'm ann michele from just my type, and i'm so excited to share with you today. sam and I not only share a love of the blogging world, but we also are good friends through our church here in houston. now enjoy and be inspired! download your favorite to your iPad or pick up one on your lunch hour! 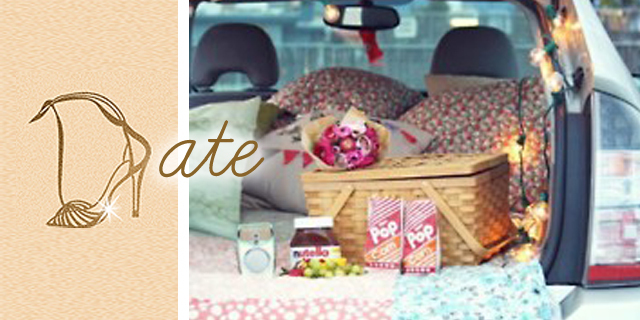 shoes, throw pillows, music, or candles... shopping doesn't have to break the bank. 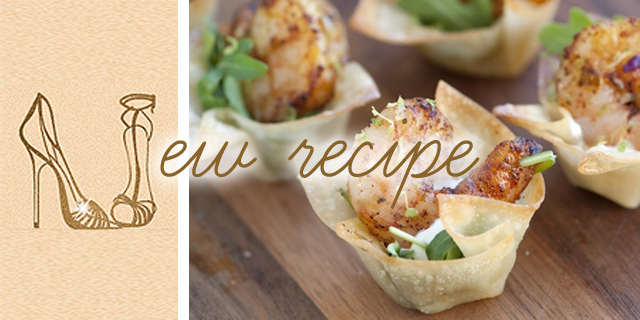 pinterest is great for finding new ideas of tasty creations! 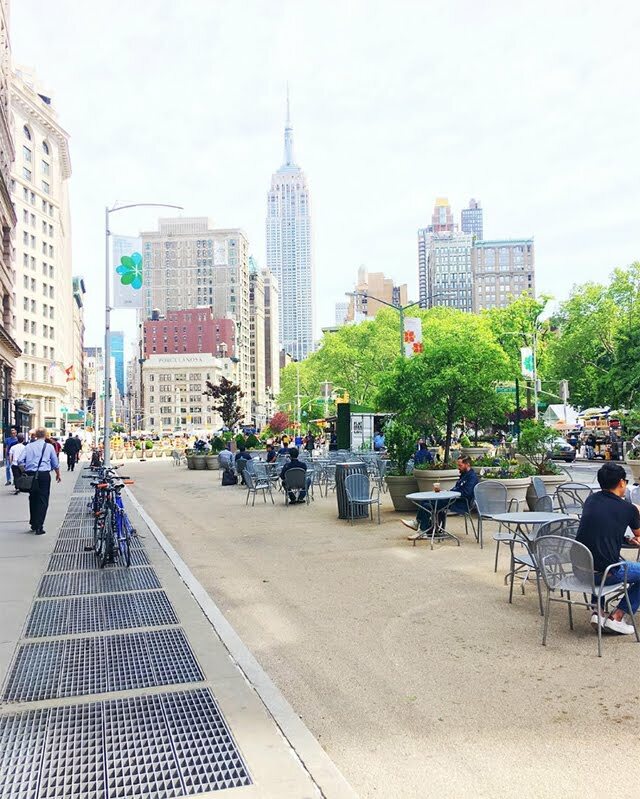 try a new place for lunch! that break in the day will help monday speed by even faster! i happen to love bubble baths, but do whatever that helps you get to your happy place. 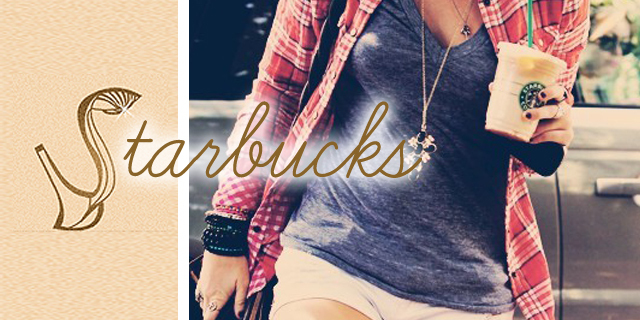 grande iced white mocha w/ whip please! now go treat yourself gorgeous!! you deserve it ; ) also a big thank you to sam for having me and letting me share some monday morning inspiration! 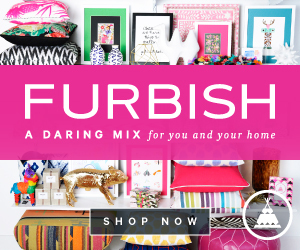 for more tidbits of design, yumminess, interiors, and sunshine head over to my blog to see what's just my type. xoxo! 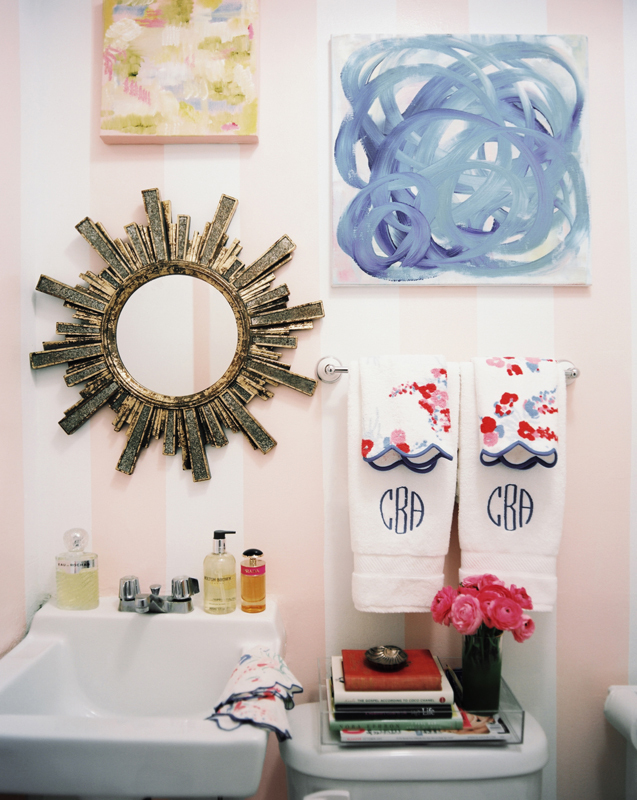 Ann Michele is beyond talented at all things design. She also happens to be a good friend! Now go check out her beautiful blog. Thanks for sharing, Ann Michele! 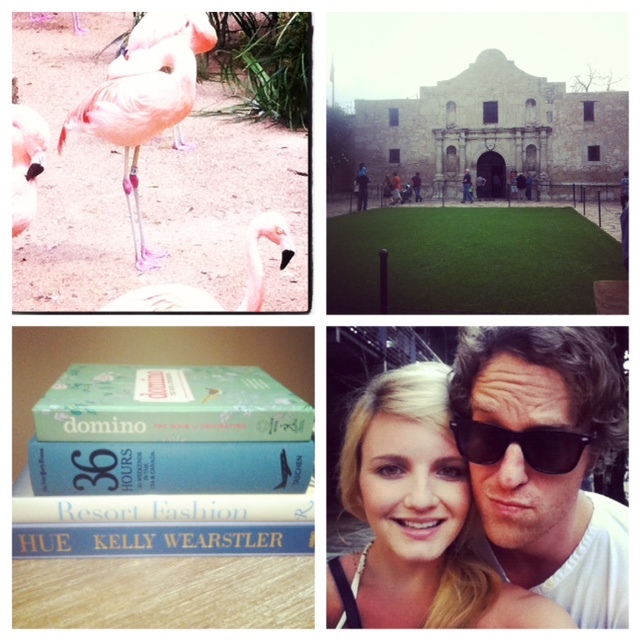 Since we are off on a little getaway weekend trip in San Antonio, I got to indulge in a little oversleeping and HGTV. I swear, this channel is pure inspiration! Seeing all these renovations, installations and interior makeovers is good for me. Since it's a lazy Sunday morning, I thought I'd share a few images that I love. No rhyme or reason to them or this post, to tell the truth.... just like my Sunday morning! 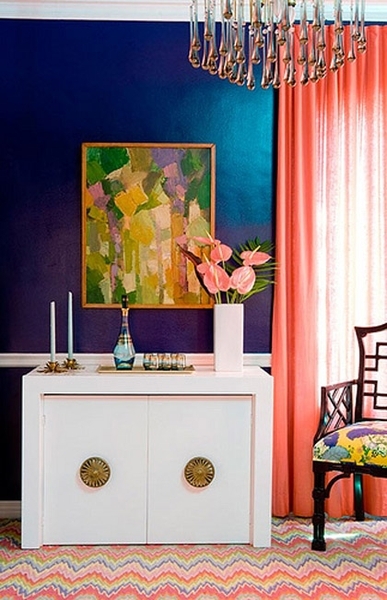 The funky carpeting and fun colors in the painting create such a statement space. I love! Last night, me and the bf headed to San Antonio for a weekend getaway! San Antonio is about 3.5 hours west of Houston. With 80 degree temperatures, bright sunny skies, and a theme park waiting for us, my inner-kid couldn't be happier! Today we are off to Fiesta Texas, a Six Flags theme park here in San Antonio. I plan to get at least one cone of ice cream. 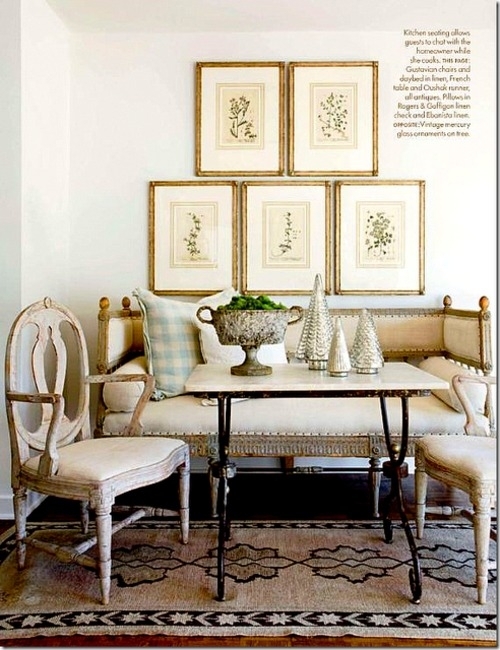 I love built-in banquette seating. Not only does it save space, it can also provide a comfy alternative to most typical kitchen seats. 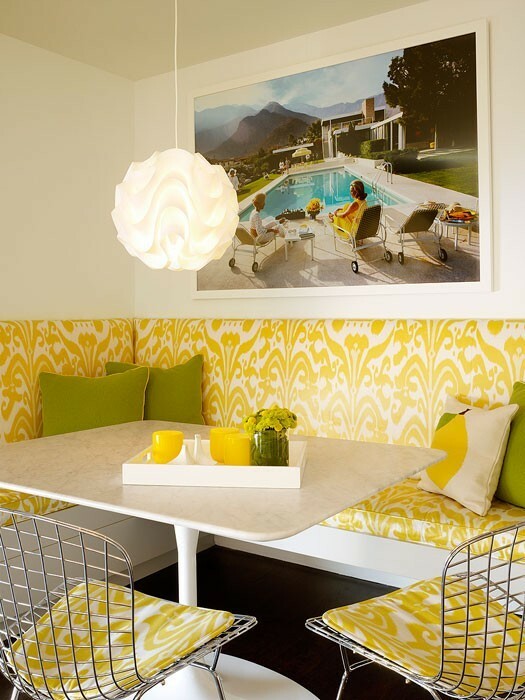 A banquette is an upholstered bench, and today I am showcasing my favorite banquettes in kitchen nooks. To see more of my dream kitchen, click here. Confession: I love equestrian art. Although I didn't grow up on a farm with my own horse, I have always been attracted to these sweet animals and their gentle nature. 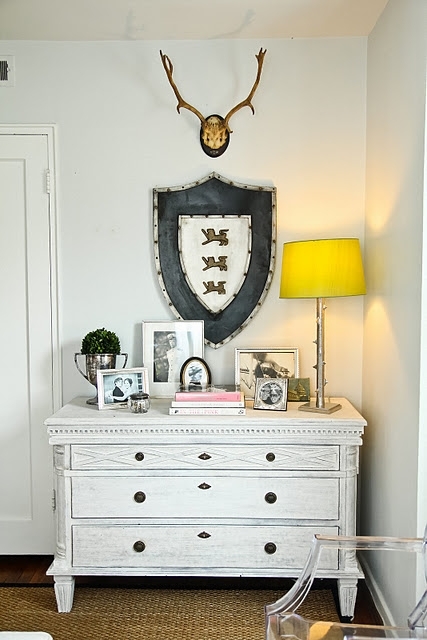 Naturally, this picture drew me in before the white nailhead bed did. 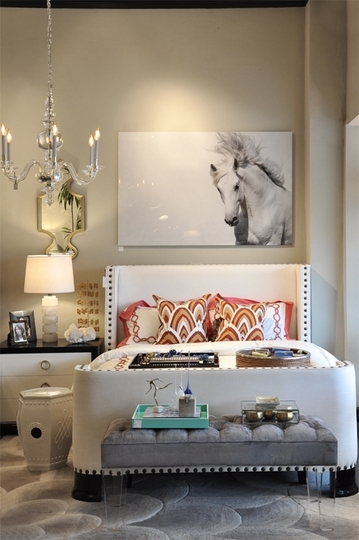 Still, the bed, the tufted bench, and the bold patterned pillows are nothing short of divine. 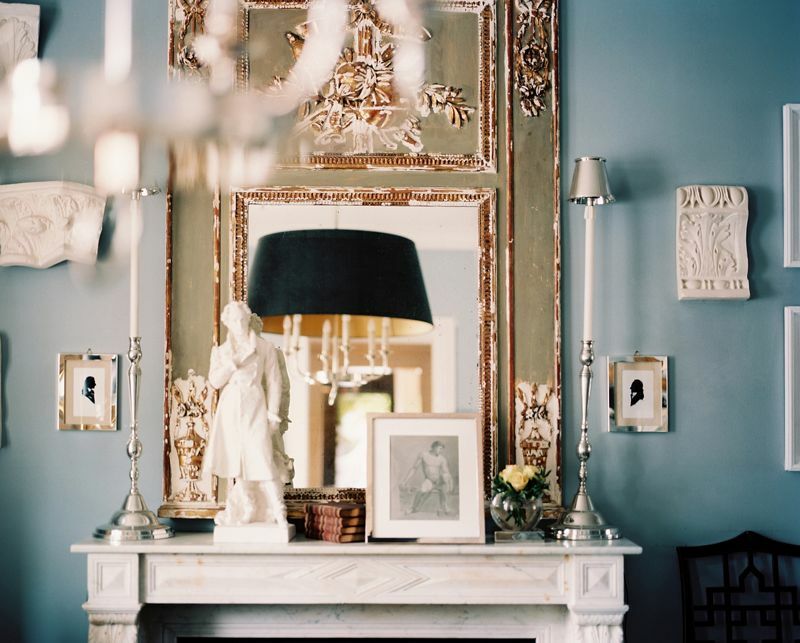 I adore this glamorous boudoir! 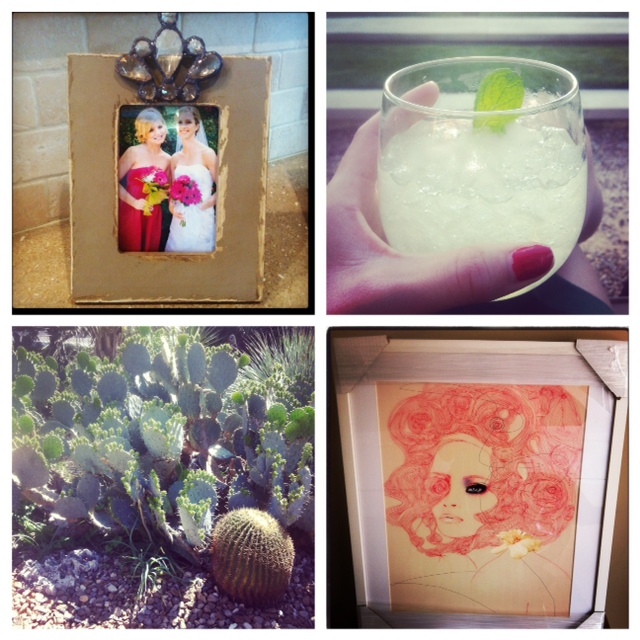 Today I am over at Michaela Noelle Designs posting about what I love and do not love. 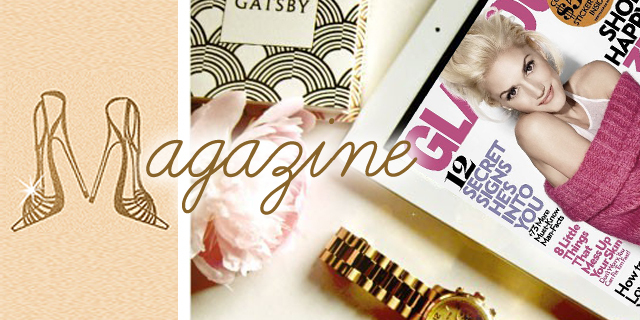 I hope you will check out Michaela's adorable blog! 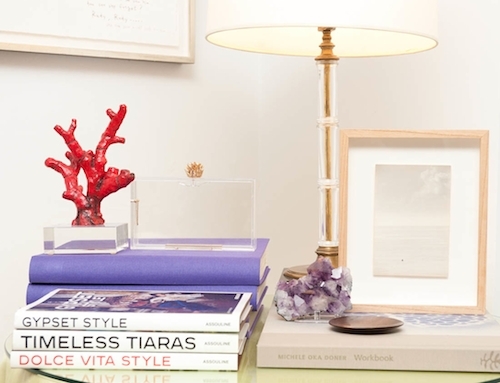 Maybe you haven't heard the news, but bookshelves aren't just for books anymore. In fact, bookshelves that display other items, such as frames, travel souvenirs, antiques, and collectibles can create warmth and intrigue. Making shelves aesthetically pleasing can seem daunting, especially when you have a large amount of shelf space. Before you work up a sweat or stuff shelves with meaningless objects, I'm here to help with a few tips and tricks I've learned about shelf styling. If you are unhappy with the way your bookshelf currently looks, take everything down until the shelves are left empty. Like any creative process, we much clean the slate so our minds can envision our end goal. This is also a great time to dust and clean the shelf space. 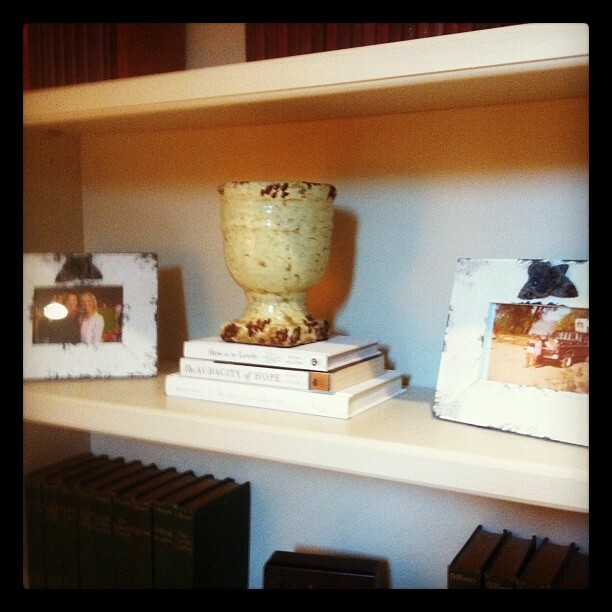 Do you have a beautiful frame you want to showcase, or perhaps an antique of some sort? Use this as an anchor for one shelf. Then, style around this item. 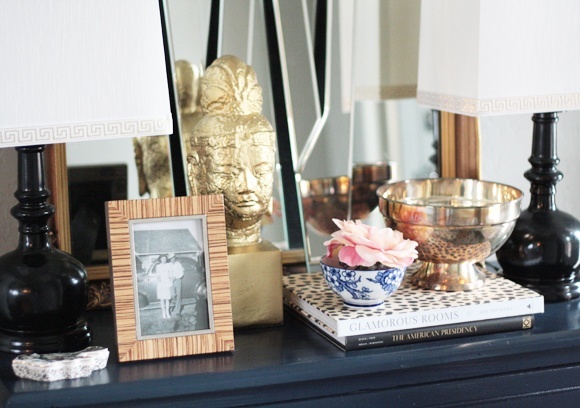 In the vignette above, I started with a white vase I love from Anthropologie. I then added a few coffee table books underneath it to give it a base and balance out the size of the vase relative to the shelf space. If I had left the vase by itself, it would leave the shelf looking bare and the vase would have nothing to highlight it's uniqueness. 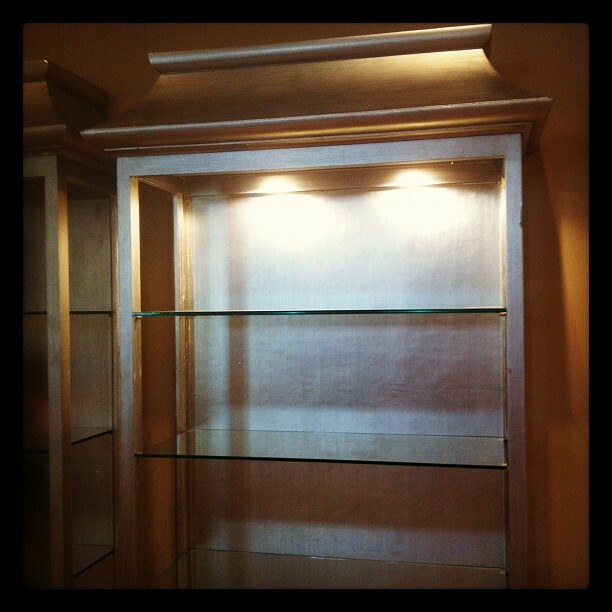 I added a frame on each side of the base to add a personal touch and to fill the shelf's sides. 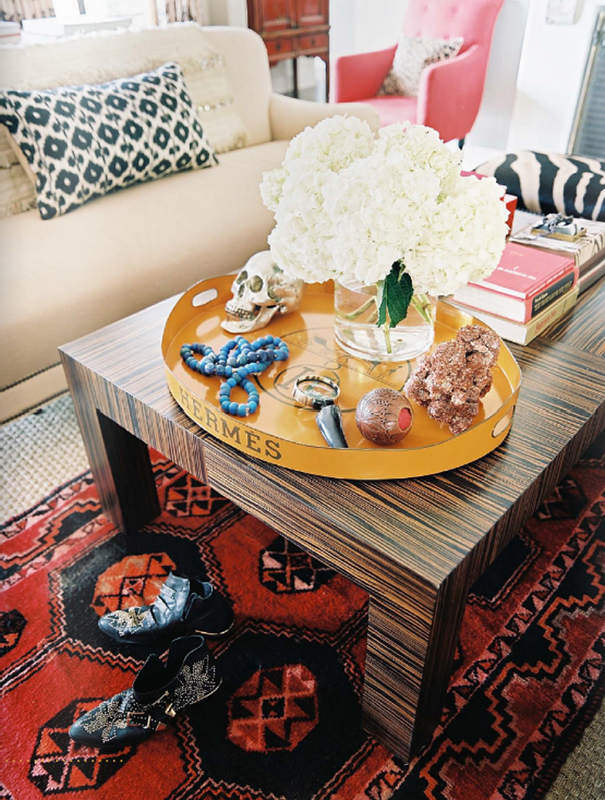 When styling shelves, balance is key. 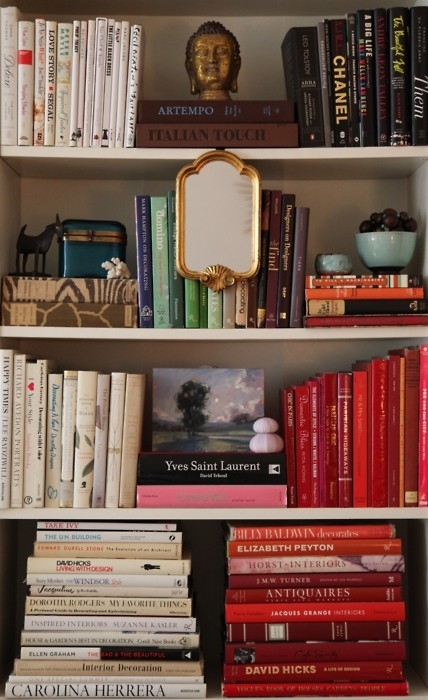 If you have an extensive library of books, one fun idea is to organize them by color. In the image above, red books are gathered together as well as white books on the bottom shelves. 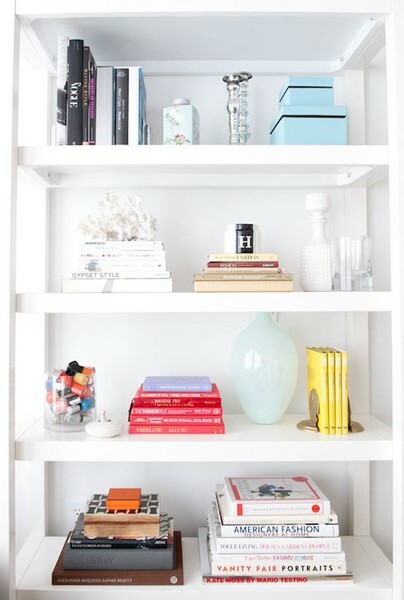 Although the shelves are completely full, this look works since the color-coding create a cohesive look. If you choose to fill up one shelf completely, it will look best to fill up all other shelves completely as the bookshelf above does. 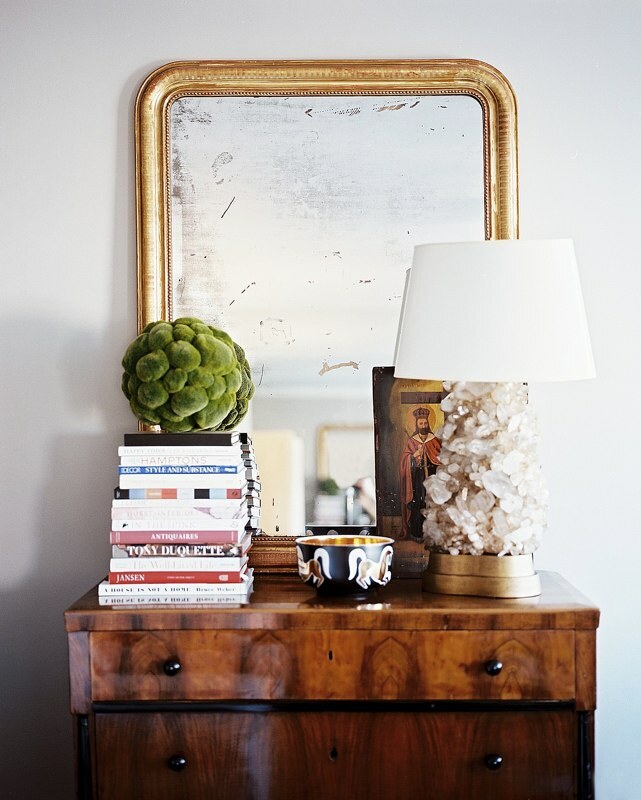 I also love the gold mirror juxtaposed against the books. This is another great example of balance. The shelves here are perfectly balanced with elements on each shelf-one side of the shelf isn't heavier than the other. 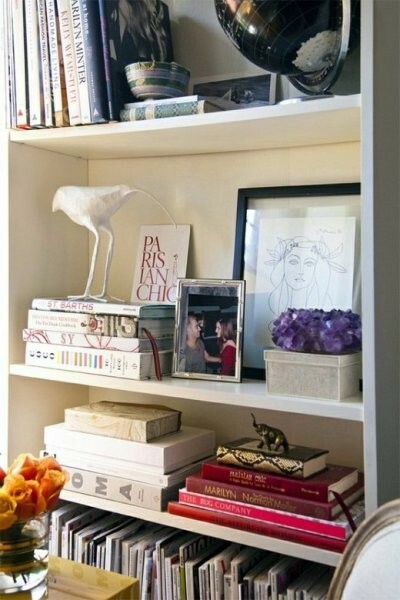 On the bottom shelf, white books are stacked neatly and are a little higher than the brown and black books that are topped with the Hermes box. 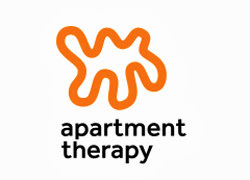 Since the lighter color is juxtaposed against a darker one, balance is created by the white stack being a bit higher. 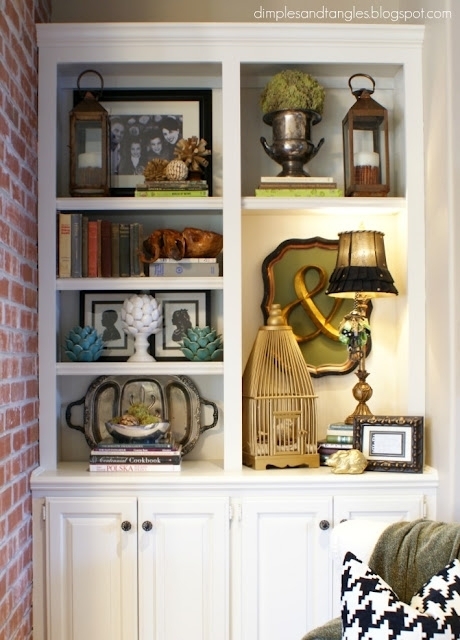 I love the ethereal feel of this bookshelf- It's very light and airy. The key to an aesthetically pleasing bookshelf is to layer from front to back and with varying heights. 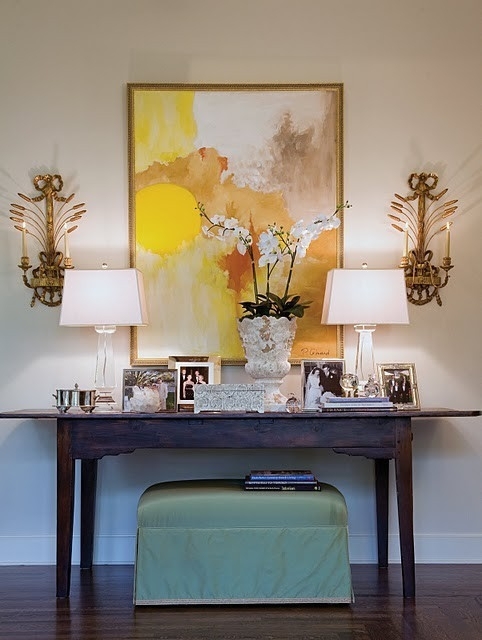 This creates intrigue to a room while also showing off personal touches. I like to start from the back and work forward on a shelf. In the image above, on the bottom shelf Jennifer of Dimples and Tangles started with the tray leaned against the back of the shelf. Then, she worked forward by layering books and topping them with the silver bowl. 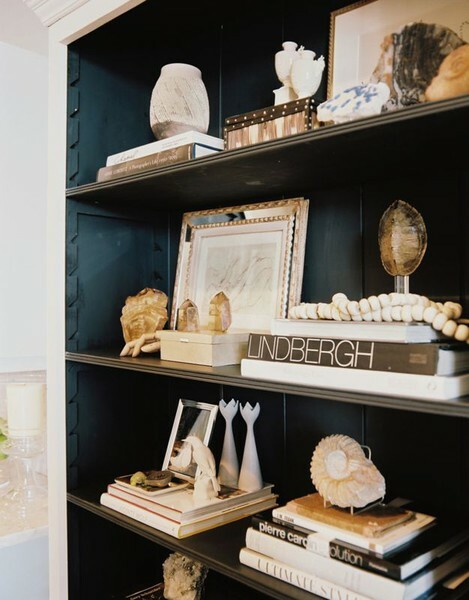 The shelves above were styled by Amanda Teal Interiors. She did a great job with layering and balance. I love the turquoise foo dogs! 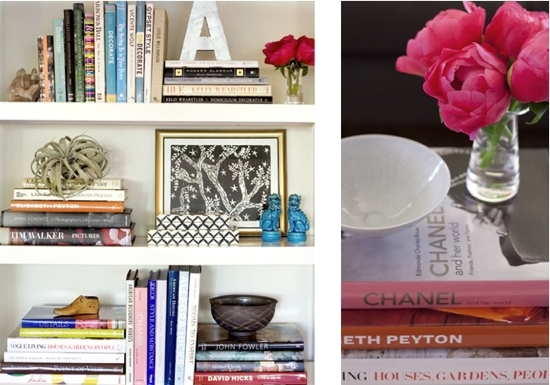 More than anything, be sure to add personal touches to your shelves to create a look that is truly "you." Have a great day today, friends! P.S.- Today I am at Bird & Branch Redesign showing off a few pictures of my home, and I am at Little Bits of Lovely sharing 5 Lovely Things. I hope you will check them out! Jessamie & Rachel are two of my favorite bloggers out there!